A dataset of 82 protein–ligand complexes of known 3D structure and binding constant Ki was analysed to elucidate the important factors that determine the strength of protein–ligand interactions. The following parameters were investigated: the number and geometry of hydrogen bonds and ionic interactions between the protein and the ligand, the size of the lipophilic contact surface, the flexibility of the ligand, the electrostatic potential in the binding site, water molecules in the binding site, cavities along the protein–ligand interface and specific interactions between aromatic rings. Based on these parameters, a new empirical scoring function is presented that estimates the free energy of binding for a protein–ligand complex of known 3D structure. The function distinguishes between buried and solvent accessible hydrogen bonds. It tolerates deviations in the hydrogen bond geometry of up to 0.25 Å in the length and up to 30 °Cs in the hydrogen bond angle without penalizing the score. The new energy function reproduces the binding constants (ranging from 3.7 × 10-2 M to 1 × 10-14 M, corresponding to binding energies between -8 and -80 kJ/mol) of the dataset with a standard deviation of 7.3 kJ/mol corresponding to 1.3 orders of magnitude in binding affinity. 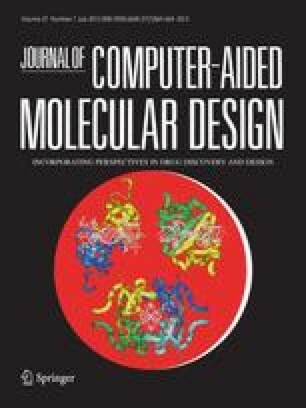 The function can be evaluated very fast and is therefore also suitable for the application in a 3D database search or de novo ligand design program such as LUDI. The physical significance of the individual contributions is discussed.